The jewelry of Arts Boheme contains a wealth of eco-friendly cultural wisdom. 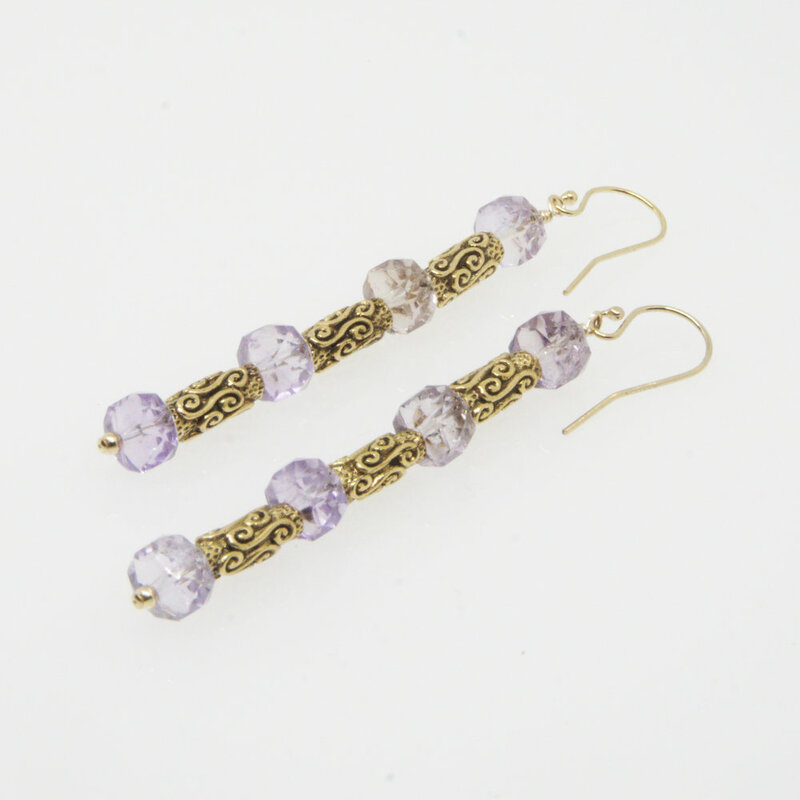 Each piece is hand-crafted, custom-designed adornments made of natural stones, wooden beads, fine crystal, hand cast metals and artisan glass gathered from around the world. Each accessory reflects the artifacts of traditions personally experienced by the designer, Cheryl Domenichelli. She first fell in love with rocks and minerals as a child and shifted her love of earth science into a healing art by the time she was old enough for college. Cheryl now holds a Bachelor of Fine Arts and a Doctorate in Education Leadership, and uses her craft to support social justice movements in the places where she's traveled. One gem at a time, she makes the world more beautiful, and more aware of its natural beauty. UWM: Self-expression and self-determination seem to be recurring themes in your choice of community organizations to support. Was there one moment in particular, when you felt like your self-expression was denied or celebrated, that inspires this passion? Cheryl Domenichelli: Such a thought provoking question! I’ll begin by saying I am the sum total of the experiences of my life. How I have chosen to react to and use those experiences has created my passion for self-expression. More than self-expression, my passion is for people and all things to be appreciated, celebrated, uplifted, and assisted in their growth and trajectory. This way of being has been with me since I was a child, however there is one moment that crystalized my understanding that equity and social justice is something I want to stand for. I had an opportunity to attend a meeting about race and understanding. In this meeting a white male friend and colleague stood to speak his truth as a parent. From the conversations he had participated in, his awareness had grown, and he said the following, “I never realized people had to tell their children to be careful because others might treat them differently because of their skin color.” There were tears in his eyes as he made this statement. In that moment, I was struck to my core because as a black mother, it never occurred to me that other people didn’t have to explain racism to their children. What a powerful moment. It was in that moment that the journey for self-expression, equity, access and social justice became the core value in everything that I do. I am very glad to see that self-expression emerges as a recurring theme. Thank you so much for noticing and asking. You use natural products; do you ever experience obstacles in informing folks about the importance of environmental justice? Sometimes people can’t see past their own immediate space. Their lens on the world is clouded with greed, selfishness, or inability to see beyond the immediate to long-term solutions and consequences that benefit us all. This is the case with our environment. We use it to gain profit, to meet immediate needs, to sustain our own lives and yet some have limited understanding of “the web of life” and how whatever we do impacts each of us. This is one of the reasons I am a firm believer in education. People who are able to think beyond the moment will have the capacity, and hopefully choose to become contributors to a sustainable way of living. We all can contribute on levels both great and small; like any effort, it is the sum total of all of the small contributions that generate the greatest outcomes. We are all responsible for our global environment. Do you have a favorite piece you've crafted (what's the story behind it)? I have multiple pieces that I just love. The one I will describe is the Frosted necklace. I chose this one because of the origin of the curated components. The horn itself was crafted by Unicorn Beads, a California design studio that creates each piece by hand. The focal red bead was crafted in Venice, Italy; each bead is created by an artist who hand forms the bead, a process known as lamp work. The white frosted beads are created in Ghana where each of the beads was also had crafted by artist. This necklace celebrates the artwork of hand created glass beads. When you know the origin of the beads, it becomes evident that artists all over the world are creating beautiful expressions in glass and though the beads are all quite different, together they create something truly beautiful. Because of my passion for equity and social justice, which is rooted in valuing all people, this necklace is in full celebration of my core values. There is so much more to this story and the people who created the components, I look forward to sharing in my journal (blog). Where else are you looking forward to traveling? Ron, my husband and I, love learning about other cultures and we love adventure. We also love history and have a strong appreciation for everyday items as expressions of art. This spring we will travel to Europe again. This time we will visit Stonehenge, travel to Venice to seek new glass artists, and then celebrate our anniversary in Paris. On our list of places to visit are the west coast of Africa, and also the east coast including Tanzania and Kenya. We also have a “bucket list” that includes Tibet; the Holy Land; specifically, Jerusalem and Petra; South America and Thailand. Basically, you could say the world! Do you have a favorite style icon for self-expression? One of my favorite style icons at this moment is Michelle Obama. My reasoning encompasses more complexities than her clothing choices; style occurs to me as an expression of the inner being; what you value, what your purpose is and your confidence to express those things in your choice of words, actions, clothing, and of course jewelry! What I know of her I have learned through her presence and the work she does. She values education, health, equity and social justice. She works on the local and global stage to make a difference for others and to empower women. Michelle Obama continues to work to make a difference, she speaks words that inspire, and she is willing to continue despite those who speak out against her. These are values I share, making her a role model for me in service of generosity, spirit, and contribution.